Portstewart is at the end (or start) of the Causeway Coast Way. From here the 'Ulster Way' continues inland around the River Bann and out towards Castlerock. Portstewart the largest town along the trail and it is the only one that is in County Londonderry (County Derry). There is no shortage of shops, restaurants, pubs and accommodation. 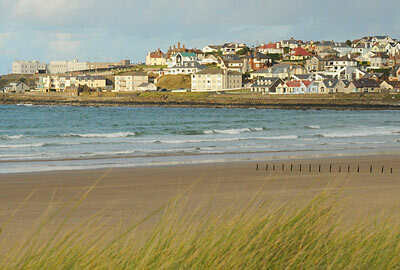 Portstewart Strand is one of three blue flag beaches on the Causeway Coast Way. The National Trust bought the beach in 1981 to help protect the erosion of the sand dunes which was been caused by the unrestricted access of motocycles. The dunes are home to many unusual plants and insects.